One of the heaviest traveled roads in the Tampa Bay Area is State Road 60 through Brandon. The Brandon area has grown tremendously in the last 30 years, often with little forethought, which has resulted in more congestion. People in the Brandon - Valrico area literally and figuratively are not going anywhere. Another 600,000 people will be moving to Hillsborough County in the next 25 - 30 years, and it's likely that a big chunk of them will move out to Eastern Hillsborough County, further impeding traffic. Can we get ahead of the rush? 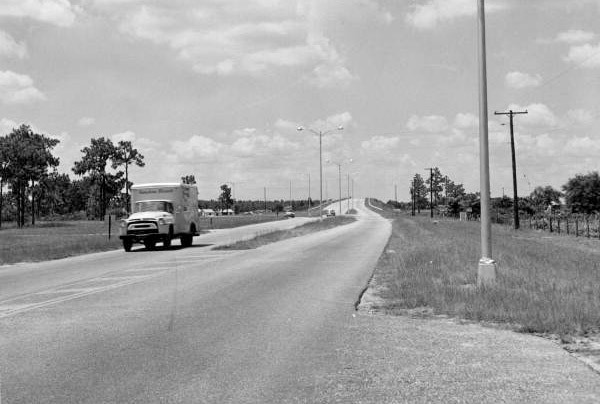 VALRICO — The time will come when State Road 60’s rural swath won’t be so rural, state road officials say. Traffic on the ribbon of pavement between Valrico Road and the Polk County line will increase 54 percent — some 71,000 vehicle trips per day — by 2040, Florida’s Department of Transportation estimates. Unless that 12.3-mile segment is widened to six lanes, it will not measure up to its designation as a major east-west corridor and evacuation route, transportation officials say. “It’s not going to be built anytime soon, but at least we can look at the impacts,” said Kirk Bogen, environmental management engineer for the DOT. Bogen estimates it will be five to 15 years before any construction gets under way. No one is plowing up SR 60 anytime soon. Sounds like someone is thinking about a plan. With the growth forecasts in Hillsborough, there will be more new neighborhoods taking over the rural areas along State Road 60. Of course, the Trib found many folks against the plan, yet no viable alternative plan that would address the future needs, except the gratuitous mention of light rail, which is in no one's plans to go that far out along SR 60 in the next 50 years. The Tribune editorial board weighted in on April 21. 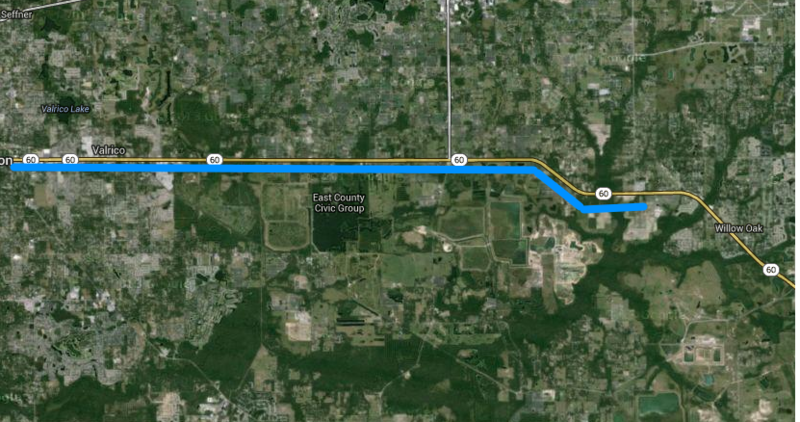 The Florida Department of Transportation’s plans to six-lane a rural stretch of State Road 60 illustrates how the state can undermine local growth plans. Nothing may happen anytime soon, but as the Tribune’s Yvette C. Hammett reports, the DOT already is making preparations to widen the 12.3-mile length of road between Valrico Road and the Polk County line. Those are reasonable concerns. But there are far more pressing needs than developing a rural highway, where expansion would likely encourage development and sprawl. The Trib goes on that the Hillsborough MPO, one of twelve(!) government agencies that have some say on local transportation projects, should be consulted. Hillsborough County Commissioner and MPO Chairman Mark Sharpe wrote to the DOT pointing out there is no demand for the project, it would be built in an area the county envisioned as remaining rural, and there are more pressing transportation needs. That stretch of State Road 60 is outside the county’s urban service area — the area where local roads and other infrastructure are planned for future development. Such boundaries are intended to discourage sprawling subdivisions that generate high costs for taxpayers. Perhaps so. The MPO are planners, but their priorities are to control growth into predetermined areas, while the FDOT's priorities are to plan ahead and avoid traffic congestion and enhance evacuation routes... such as SR 60. We will have growth, and this is a plan that at least attempts to get ahead of that growth. 600,000 people are not all moving into downtown Tampa, where only about 7,000 currently live, and over 83% of the local population lives greater than 10 miles from downtown. It is bad public policy to use state highway construction as a growth driver. We don’t believe that is the DOT’s motive here, but it is likely to be the result. But how is using highway construction for a growth driver any different than using light rail and transit oriented development as a growth driver, a position the Tribune has repeatedly proposed? They are BOTH bad policies. Let's have transportation policies that address our mobility needs. Lets have economic and development policies that address those issues. Yes, they are some dependencies, but they are different issues, and can be addressed with much different solutions. We see this pattern over and over again the Tampa Bay area. There's a plan to fix or enhance a heavily traveled road, trying to get ahead of the growth, only to be thwarted by NIMBYs, special interests, community plans, and the Urban Land Institute. Adding a toll road to complement heavily traveled, State Road 54, in south Pasco, has met with stiff local and political opposition. Yet they have no viable solution to address the expectations of another 20,000 homes along the route. At least the Tribune has taken a more muted approach on SR 54, but not endorsing the toll road idea. Although we’re not sold on the proposal, that doesn’t mean it shouldn’t be explored. Clearly, something has to be done. Of course, everyone cites Pascos Urban Land Institute $125,000 study (why do they always use ULI around here? ), which always come up with the same answer around "walkable communities" whether its in the exurbs of Pasco or downtown St. Petersburg? Next time, save taxpayer money, and regardless of the plan, community, transportation needs, just change the title of ULI's standard template and insert "walkable communities" into some report and be done. Let's not forget Hillsborough County's great contribution to anti-planning, the Community Plans. Once these community plans are approved, they are adopted into the Hillsborough County Land Development Code, where they can place all sorts of restrictions on road and land use. Gunn Highway will be identified as a County roadway, which cannot be widened further due to social, economic, policy and environmental constraints. Here we have a major commuting artery between Pasco and northwest Hillsborough constrained as a 2 lane road by a community plan. Development continues in Pasco County, traffic increases on Gunn Highway, which is becoming more and more dangerous. But we can't do anything about it since the Keystone - Odessa community plan prohibits addressing Gunn Highway. So here we are. We can't plan and get ahead of the growth. We have to wait until we really need improvements. That's the way we've always done it, right? But, then its too late, then everyone complains. The NIMBY's and Community Plan proponents complain when planners actually plan for growth, yet they won't much like the alternative of further congestion if nothing is done. They will only have themselves to blame when congestion worsens with the expected growth in Hillsborough County. We live in Brandon and there are really only 3 east-west routes through the ever-more-crowded area: Hwy 60, Lumsden/Causeway, and Bloomingdale. These roads are already heavily congested during peak times and we wonder where all the new traffic has come from lately? We enjoyed Brandon when we moved here 13 years ago as a nice suburban area that offered everything we needed. Now? We'd gladly consider moving someplace less congested, although I'm sure in 10-12 years time, that area would see an increase in traffic and congestion too.